1790 Edmund Burke's "Reflections on the Revolution in France"
"This polemical work was written in response to Jefferson's recent proposals concerning American liberty and to claims that a monarchical government so rotten as France's must perish. Burke felt the need to express his belief in the practical and human side of political systems - that revolution per se was not a source of liberty, merely another means by which inequality and destitution (financial, moral, and political) might be extended perhaps indefinitely. Burke's ideal was the settled constitutionally conscribed state, and that life under such a government was the best guarantor of liberty. A paradoxical position, but one that almost instantaneously made his pan-European reputation. With this work Burke had firmly arrived: "The Reflections achieved immediate success ... In the eternal debate between the ideal and the practical, the latter had never had a more powerful or moving advocate, nor one whose own ideals were higher"
An interesting aspect of this book is its original ownership by James Hatch, Esq., a contemporary of Burke whose famous Claybury Hall was rebuilt and landscaped in the year that this volume of Reflections was published. 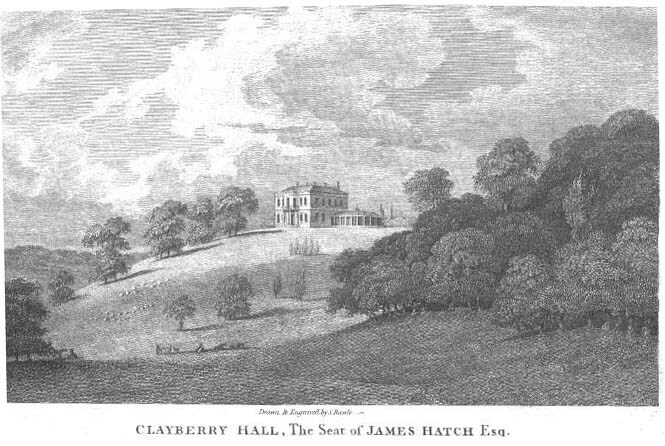 Hatch, whose bookplate in the volume is shown above, was a peer and malt distiller from Bromley who had the landscaping on the grounds of Claybury Hall, shown in the period engraving below, done by the famous designer Sir Humphry Repton. The text block on this book is in nice condition, very fresh with no marks and only a little darkening of the title page. The back cover is detached and the front is barely hanging on with edge wear and some pieces missing from the top and bottom of the spine and label, as shown in the pictures above. A little restoration work will make this a very fine volume. This is a wonderful early edition of Burke's famous work with a nice association through its ownership and bookplate to Claybury Hall, James Hatch and Sir Humphry Repton.